1. Cut out a picture to fit inside of a bottle cap. 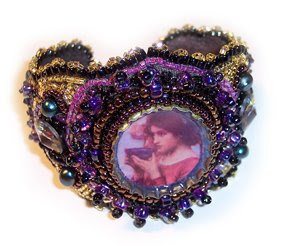 Fill the cap with a thin layer of Diamond Glaze, Liquid Glass, or resin. When nearly dry, place picture inside and cover with a thin layer of the same glaze. Let it dry. 2. Trace around the bracelet blank to create an outer edge on one piece of ultrasuede. Secure the bottle cap cabochon to the fabric with E6000. When it has dried, begin to stitch around it. 3. 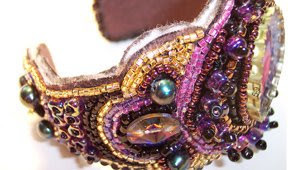 When you have completed your embroidery, make sure there is a line of #11 seed beads around the entire outline of the bracelet. Cut the embroidery out, leaving about ¼ to ½ inch of extra fabric. 4. 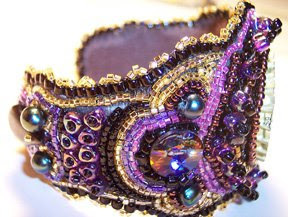 Using a thin layer of E6000, glue the embroidery to the top of the bracelet blank. Glue another piece of ultrasuede to the inside of the blank. You don’t have to use much glue ~ this is just to keep them in place until you finish stitching the two pieces of fabric together. Cut the two pieces even with each other, very close to the last line of stitching. Be careful not to cut any threads. 5. Stitch a row of beads to cover the raw edges. 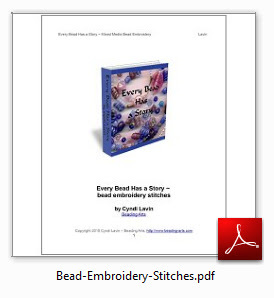 Using #8 seed beads, bring the needle down through one bead at a time. Taking the needle to the back, bring the thread up through both layers of fabric, exiting behind the outer row of #11 seed beads. 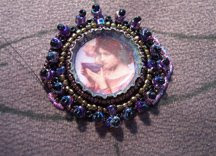 Pass the thread between two of the beads in this row, and needle up through the bead that was just added, pick up another bead and repeat the sequence all around the outside of the bracelet. 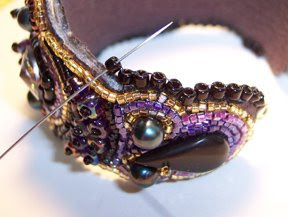 This technique leaves the beads standing up with their holes facing outwards. 6. Weaving in and out of the #8 seed beads, add three #11 delicas to cover the holes and to create a picot finish. Very cool - giving me some ideas to attempt! Come on you guys...GO FOR IT!! !